There are only a few days to its official launch but we already have almost everything. 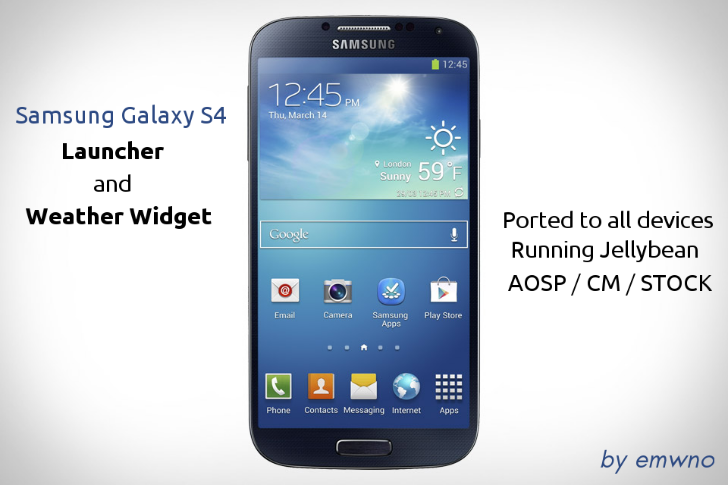 Yesterday was released the source code and today I bring you a tutorial so you can install the Launcher and official weather widget Samsung Galaxy S4 on your device. From XDA have managed to port the Galaxy S4 launcher to install it on a lot of Jelly Bean devices running operating system, regardless of whether it comes ROMs Stock or cooked (has been tested in Touchwiz, CM10, CM10.1, AOSP , Sony, LG ROMs). Given that this is the first final version, we may find some minor bugs, but according to early reports, the launcher works wonders. 1 - The first thing to do is download the appropriate file with the screen resolution of your device and wallpapers. 2 - Then, you must place. Zip file you downloaded in the root of your phone memory. The wallpapers can move them to wherever is convenient. 3 - Then you turn the smartphone to enter Mode Recovery. The way to do depend on each device but overall for Samsung teams must press Volume Up + Home button , and while holding both simultaneously press the Power button . Once recovery is recommended to backup the system (to get back to it in case something goes wrong), and then do the wipe cache partition and wipe dalvik cache . 1. Press Start to begin the process. 5 - Once the installation is complete, click on Reboot system now to restart the device and go! I'll be enjoying the launcher of Galaxy S4 on your smartphone! You can also install the wallpapers. What do you think of the new Launcher the Galaxy S4 ? Leave me your thoughts in the comments!